"If we can't accomplish the goals of musicality and application, we aren't going to build it," states the co-founder and president of Aguilar Amplification, Dave Boonshoft. This year, Aguilar celebrates its 10th anniversary, and over the past decade, this founding principle remains at the forefront of Aguilar's groundbreaking design and engineering concepts. In 1995, Aguilar began as the manufacturer of a single bass preamp. Today, that same preamp is recognized as a contemporary classic and the industry standard in major recording studios found throughout the world. Along the way, Aguilar has become one of the fastest-growing manufacturers of high-end bass amplification with the addition of power amps, speaker cabinets, combo amps, onboard preamps, and a direct box to their product line. 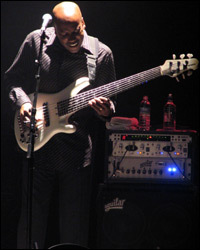 Through an endorsing artist roster that reads like a "who's who" of both legendary bassists such as John Patitucci and Gary Willis as well as up-and-coming stars including Chris Chaney and Chris Tarry to name just a few, the tones generated by Aguilar units resonate prominently throughout today's music. From the studio recordings of pop and country radio hits to live performances of timeless jazz standards in coffee houses and rock anthems on stages in arenas around the globe, "the Aguilar sound" has become synonymous with harmonically-rich and dynamically-diverse bass tone. In the interview that follows, Dave Boonshoft outlines Aguilar's history, and speaks about many topics including his philosophy on building amplification units, common features shared amongst Aguilar amps, the specifications on the latest pieces of gear introduced in the Aguilar line including the AG 500 amp and S series cabinets, as well as the future of Aguilar Amplification. How did Aguilar Amplification become founded? When I first moved to New York City in the early 1980's, it was near the end of the once-lucrative studio scene, before synthesizers took over much of the work. I was a studio musician, and I played every conceivable gig including jingles, records, and tours. I've always been a bass player first. I still own a small record company, but there just aren't enough hours in the day to gig at a professional level any longer. I still play on records that we produce in New York, though. The name of the label is Naked Music, and we're pretty well-known in dance and electronic music. In the late 1980's, Roger Sadowsky used to work on my instruments. At that time, he was working with Alex Aguilar on a new preamp for his basses. I was testing what later became the Sadowsky preamp on gigs for Roger. I would give my feedback to Roger, and he would pass on the information to Alex. Roger introduced me to Alex, and we began talking. Alex and I really didn't have a formal relationship at that point. Alex opened up a repair shop where he fixed amplifiers. I continued to play music, but at a later point I went into the studio business. I owned a lot of vintage recording equipment. I actually opened my own company called Boonshoft Vintage Rentals, and I rented out all the high-quality Neve mic preamps, Telefunken mic preamps, and compressors. It was all really high-quality gear. Also, Jay Denes and I started Naked Music as a production company and studio. Even though I had been playing for many years, it wasn't until I had got involved in production that I realized what went into the sound on stage and in the studio, and I became really dissatisfied with the gear that I was playing through. I started searching for someone to build me a preamp that would be specifically designed for a bass player but would give me the sound I could get out of a high-end Neve or Telefunken preamp. Alex was doing repairs just down the hall from Roger so I paid him a visit one day, and I drew out on a napkin what would become the DB 680. It had all the features I wanted in a bass preamp and Alex designed it. This project was originally supposed to be a one-of-a-kind preamp. We never had any intention of making more of them. When we eventually decided to put the preamp into production, we tried to come up with numbers that sounded snappy. I had a tremendous amount of admiration for a piece of gear called the Fairchild 670. It was an enormous tube compressor, and it was a wonderful-sounding piece of audio gear. We decided to name our preamp the DB 680 because 680 was 10 better than the Fairchild 670, and the DB prefix was the initials of my name. We really didn't think people would expect those numbers to signify anything special, but years later, we wished we would have thought through the naming process a little more. I've always been very entrepreneurial, and I knew we had something really special with the DB 680 so Alex and I decided to go into business together, and we formed a company in 1995. At the beginning, Alex continued to do repairs, and I still had my recording studio so production started off really slow. We made two DB 680's and took them to a NAMM show. Soon after, we needed an amplifier to compliment the preamp so we created the DB 728. I started working out of our first shop in mid-town New York City at 1600 Broadway. Initially, we had no employees, but in a short time we had one part-time worker, followed by a full-time worker, and then additional full-time workers. It just evolved from there up to where we are today. I was the conceptual and entrepreneurial components of the company, and Alex provided the engineering and design. Whenever you attend a NAMM show, you'll see that most companies are comprised of at least two people. One guy takes care of the business aspects of the company, and the other person has the creative mind. I think that one of the reasons we've succeeded in our endeavors is due to the fact that we had a good balance knowing how the gear should perform through brilliant engineering and reasonable business skills to make things work. If you take either one of those parts away, things just aren't going to work. That's how it all began. I purchased Alex's shares of the company at the beginning of 2004. Alex hasn't been involved in the company since then. Geof Lipman, who had worked under Alex, became our Chief Technical Officer. Over the years, we've become really efficient in how we do things so we currently employee a staff of around seven people at any given time to keep up with the demand. We've put together a lot of popular products for being in existence for only 10 years. Were there pre-existing features on the bass amps and cabinets that you were personally using as a bassist before forming Aguilar which you felt you could improve upon? I felt that many of the bass amps I was using didn't contain the proper harmonic structure. They always sounded like they were lacking the correct overtones. The distortion seemed to be so high. They just didn't sound warm or full. You couldn't use any of that equipment to go to tape. However, you could take a Telefunken P76 to tape, and it sounded absolutely beautiful. There just wasn't anything that was specific to bass that was as good as a vintage mic preamp. The problem with those vintage mic preamps is that you couldn't rackmount them back then and make them road-worthy. They just didn't work all that well outside the studio setting. Some of the features that were incorporated into the DB 680 were things that I actually liked about other preamps. I liked a parametric eq because I felt like it gave me the flexibility to do broadband boost and narrow band cuts in a musical fashion. Walter Woods had a bright switch with two positions on his amps, and having two boost positions made a lot of sense to me. We've always tried to design our products incorporating features that offer our customers the widest range of achievable musicality. 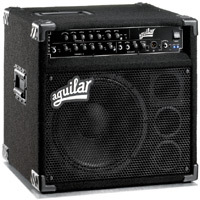 Since its inception, what has been Aguilar's principle philosophy regarding amplification? The bass, its pickups and strings, the amp and the cabinet you are playing through are all integral components of the sound you are producing. You can't subtract any of those parts without altering the equation and the overall output of the sound. We are providing the other half of the bass guitar's sound. Whatever we create has to be intrinsically correct for the instrument. For us, this means we have to create a true harmonic structure with a terrific dynamic range, and a very fast transient response for it to be a good musical instrument amplifier made specifically for bass. Because the bass frequency is so low, you have to figure out solutions to problems inherent to bass instruments and meet those challenges, and I think we've accomplished that with our products. From an engineering perspective, what is the greatest challenge in trying to amplify an electric bass guitar? The biggest challenge is making an amp were the dynamics feel musical and accurate to what the bass player is doing. Bass guitar has a huge dynamic range. How would you define the "Aguilar sound?" My hope is that someone playing their bass through any of our amps would feel like that amp is completing the sound of their instrument. All of the overtones you'd expect to be there are present. Hopefully the transient response feels like it is mirroring that person's playing. The volume level is there, and the dynamic range is there. We want the Aguilar sound to be the musical completion of the bass guitar. That is how I would define it. What design concepts make Aguilar amps unique from any other amp manufacturer in production today? It's hard to say because I'm not sure what design concepts other manufacturers use in their products. I only know what we are trying to accomplish with our gear. For example, our newest amp is the AG 500. It has two channels, one for clean tones and another one to generate distorted tones. We designed the saturation channel so that you can acquire any level of saturation at any level of volume. Many other manufacturers just set up their amps so you can overdrive the input gain stage and only obtain one kind of distortion. With the AG 500, you can tune in different levels of distortion. We didn't invent this because it has been used in electric guitar amplification for years, but it has been left off of bass amps. As you turn up the level of distortion, you need to be able to add presence and level out the mid-frequency in order for the distortion to sound intelligible. From a design perspective, we really try to optimize what is going to work well and then proceed in trying to accomplish our goals. Building a great amp is similar to recording a great song. You have to recognize when you've arrived at your goal without stopping before you are really done. Asking yourself when it's really correct is a very difficult and subjective decision to make. There is a lot of trial and error involved in the design process until you get the product right. There are always problems encountered along the way that weren't considered in the initial concept so you have to go back and discover solutions. When you are designing a product, do you have a particular style of music in mind for which that unit might be most appropriately suited? To a certain degree, yes. For example, the DB 680 was originally designed for me to be used within the studio setting. With the AG 500, we were certainly considering the needs of rock bassists with the saturation channel. It can have a very broad application though. The DB 680 works really well in the studio because it has so many studio-friendly features. There are actually several famous bass players that endorse other amp manufacturers but still use the DB 680. The DB 680 wasn't really created with a specific style of music in mind. Legit jazz players probably aren't going to be interested in the distorted channel of the AG500 so that is what we created the AG500SC, a single channel version of the AG500 without the distortion. Besides amps, you also make a couple different lines of speaker cabinets. Could you tell us about them, and what types of speakers are utilized in Aguilar cabinets? We've been working with a proprietary off-site woodshop for a number of years. They build the cabinets to our specifications. We use Eminence speakers in all of our cabinets. They are great speakers. Eminence will work with you on the design process and make their speakers to your specifications. They make speakers for practically every bass cabinet manufacturer. At what point did you decide to add cabinets to Aguilar's already existing line of amps? Financially, it's very difficult for a company to make only amps or only cabinets. About two years into forming the company, we realized that we needed to have a line of cabinets in order to be a major player in the amp manufacturing market. It was a natural evolution for us because we were already making the amplifiers, and we didn't want to only offer half of the amplification and then let somebody else be responsible for the other half. I don't have a problem with letting somebody else be responsible for the bass, but anything within the amplification chain, I'd like to be part of it. 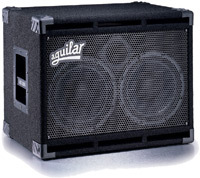 In 2004, Aguilar introduced the AG 500. How does the AG 500 differ from other Aguilar units such as the DB 750? The DB 750 has always been recognized as our flagship amplifier. The AG 500 is not a hybrid amp like the DB 750. It's all transistors. Sonically, the AG 500 is going to react very quickly to your playing. It contains a really high-quality preamp so the sound is warm and full, but there are no tubes in the preamp. The AG 500 is a much lighter amp than the DB 750. It uses Class T switching technology so there is no need for a fan. The DB 750 has an enormous number of transistors in it, which generate a lot of heat, along with a big heat sink and a huge transformer. The DB 750 has an incredibly high-quality power amp that produces extremely low distortion. It is combined with an all-tube preamp section where all the tone generation is created. In sum, the DB 750 has a ton of clean power that pushes the tone within the preamp section. When we designed the DB 750, we recognized that if it cost $1,000 less and weighed 30 lbs. less, everyone would buy one. In order to address these issues and include an additional feature in distortion that was not available on the DB 750, we created the AG 500. The AG 500 is an attempt to make a more portable package that sounds warm and full and has the Aguilar sound but is more practical. After I played through the AG 500 for a few months, I started to get the feeling that I didn't want to play through tubes any longer because they felt kind of slow to me. Overall, the AG 500 is a much more versatile amp than the DB 750. The AG 500 is a professional amp that is lightweight, powerful, and musical. The AG 500 takes up a lot less space than the DB 750, too. The DB 750 is a deep 3-space amp while the AG 500 is a small 2-space, 17 lb. amp that you can carry around in the new bag we make for it. They have different sounds, but they are both part of the Aguilar family. A lot of people like the DB 750 because of all the volume and headroom available, but we sell a lot of the AG 500's to bassists playing death metal for the same reason. The AG 500 is a completely different product than the DB 750, but it was created with the same goals in mind. If we can't accomplish the goals of musicality and application, we aren't going to build it. 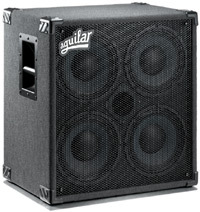 Last year, Aguilar also debuted a brand new line of cabinets called the S series. Can you distinguish the primary differences between these cabinets and the original GS line? We wanted to do a less expensive line than the GS series yet still provide a very high-quality cabinet. This presented a real engineering challenge because the tweeter and crossover that accompanies it in the GS cabinets are really expensive parts. Most of the time, people try to eliminate the most expensive parts from the product in order to make it cheaper, but if you do that, you end up with a horrible product that doesn't solve any engineering problems. We made a prototype without the expensive tweeter and crossover, and it sounded terrible. Why should we make a cheaper product that sounds like crap? There are plenty of manufacturers that already do that. Why should we do that? We went back to the drawing board with the concept of making a great cabinet that has its own reason for being and its own application. It also needed to be worth the money we expected people to pay for it so we decided to go back and include the same tweeter and crossover that is in the GS cabinets. We decided to come up with an entirely new sound from that of the GS cabinets. The S series cabinets are much more midrange-forward. For bassists gigging in a coffee shop or bar, the S series cabinets are going to work the room a little better. By reducing the amount of power capability that these speakers have and using a stamped-frame driver, we were able to cut our costs and pass that savings on to the consumer. These cabinets will still handle more power than most people will ever need. We were also able to save some money by using MDF instead of plywood in the construction of the cabinets. MDF is a high-quality composite material that actually has fewer voids than plywood. It's basically reconstituted wood, and it's a great sonic material. Plywood can actually prove to be very problematic depending on how it's milled. The primary reason builders don't use MDF for bass cabinets is due to its heavy weight from all of the glue content. Instead of using a shelf-port on the front of GS series cabinets, we decided to rear-port S cabinets. This would allow us to eliminate all of the extra weight just from using MDF, and the S series cabinets are actually lighter than the GS cabinets. We use the same gauge of steel grill and corners on both series of cabinets as well. We were able to save money in places where we didn't have to compromise the concept behind the cabinet, and we believe the S series cabinets are much better than other cabinets at comparable prices. The S series cabinets have a different design and a different sound than the GS series. They both produce the entire range of the tonal spectrum, but there is a slightly different flavor. Because flavor is subjective to everyone, one bassist might prefer the flavor of the GS cabinets while another bass player might prefer cabinets within the S series. From an application standpoint, the S cabinets work great in a club because they have a certain punch to them. Are there certain features that are common amongst most Aguilar amps? Sometimes certain features will come in and then go out of fashion. We put Speakon connectors on all of our amps. A few years ago, these connectors weren't the standard, but now they are common on many manufacturers' amps. A tuner output, effects loop, and a good D.I. are general features that are standard and expected to be on amps. I can't imagine us not putting these features on an amp. We try to put as many features on the front panels of our amps as possible so the user can easily access them without having to always reach behind the amp. There are so many variables we have to consider when designing an amp from circuit board layout to safety regulations because certain components can't co-exist in close proximity, but we always try to make the unit as user-friendly as possible. Geof Lipman, our chief engineer, is responsible for all of our design processes from start to finish. Currently, what is Aguilar's most popular-selling unit? We are selling a lot of speaker cabinets. Our onboard preamps have always sold really well, and both the AG 500 and AG 500SC are very popular. The DB 750 has always maintained strong sales and even the DB 680 sales remain strong after all these years because it was designed so well. There is nothing quite like the DB 750 or the DB 680 that is currently available on the market. They have withstood the test of time. If you can create a product and then 10 years later people are still purchasing that product from your line, you know its good piece of gear. Aguilar presently markets its onboard preamps to over 50 bass builders. What do you feel has contributed the most to the success of your electronics? The onboard preamps are a result, once again, of a great idea that was musical combined with great engineering. We certainly didn't want to put anything in a bass that didn't have an incredible amount of headroom and terrific dynamic response. There were already a lot of preamps available that diminished the sound of the instrument so we didn't want to just put out another lackluster preamp that compromised the integrity of the bass just for the sake of having one. We came up with a preamp that a superb dynamic range with low distortion and the correct frequency curves on the boosts. I've always been a huge fan of vintage instruments, and I love passive instruments, so if we were going to do something to make an instrument active, I wanted the preamp to sound and feel like it was part of the instrument. Right now, our preamps are being used by close to 100 different manufacturers. We sell quite a few of them to manufacturers who offer our preamps as options in their basses, and we also have quite a few builders that have specific models which feature our preamps in them. There are also many online bass shops and specialty stores that sell our preamps to builders who just make a few basses here and there as well as to players who are looking to swap out the electronics in their current bass with ours. The preamps have been a very rewarding aspect of our company. Now that Aguilar produces several lines of amplifiers, preamps, combo amps, speaker cabinets, and other electronics, where do you envision Aguilar expanding from here? In the future, we will debut completely new lines of amplification and continue to expand current lines already available. We will be releasing more products within the AG series. We will also continue to expand the OBP line, and we have a few more cabinets up our sleeves as well. Are there any plans to develop pickups to compliment Aguilar's very successful preamps? That is a project that is still on the backburner. At this point, it's only a question of when. We started working on pickups and then we got wrapped up in the AG line, and we just couldn't work on both of them at once. Someday we will be producing pickups. For someone debating upon which Aguilar amp or cabinet would best suit their particular needs, what are some of the variables a person should take into consideration? There are many variables to consider. Obviously, you should try to listen to as many of the amps as possible to see what sounds good to you. That is a given. Then, you have to ask yourself a series of questions. What is your budget? How much volume do you need? Is weight an issue? These variables are all secondary to the sound you are trying to obtain and the application you plan on using the amplification within. The AG 500SC is a high-powered, lightweight head, suitable for every bass player. This bass head combines an easy-to-use yet versatile eq with 500 watts of power to create the perfect amp for the gigging bassist. Four bands of active eq with bright and deep switches provide every tone from funk to rock to jazz. A flexible effects loop and pure-sounding D.I. are easily accessible on the front of this amp. Great features, tons of power, and an affordable price make this amp a classic. Includes removable rack ears and flexible carrying handle. Optional 2 space Rack Bag available. The S 410 is designed to project the volume and tone that is perfect for gigs of any size. With its rear-ported design, this cabinet weighs less and has a smaller footprint than other 4x10 cabinets. Aguilar-designed Eminence drivers, a P-Audio tweeter, and Aguilar's custom crossover including tweeter level control combine to make this the highest quality cabinet in this price range. The AG 500-112C combines the power and versatility of the AG 500 bass head with the award-winning GS 112 cabinet to give bass players a combo that will fit into any style of music. With the ability to add an extension cabinet for a full 500-watt rig, this is one of the loudest combo amplifiers on the market. Two footswitchable preamp channels and a fully adjustable saturation circuit provide a wide range of tones to accentuate your playing style from crisp slap to dirty pick playing. With its combination of small size and big Aguilar tone, the AG 500-112C is the combo amp you've wished for.